A head start on studying robotics! The education system worldwide is evolving to incorporate robotics in the classroom so that students understand the fundamentals of this new technology while developing the necessary building and programming skills associated with it. At the same time, even at home, children are eager to experiment with robots and integrate traditional play and fun with the electronics world. Engino® Robotics Platform (ERP) is specially designed for younger students and takes into account the most modern pedagogical principles of ICT and STEM learning. The set consists of all the basic parts for studying robotics! These include the ERP Mini controller, RJ cables, two InfraRed sensors, two motors, and a USB cable! You can find easy-to-follow instructions for all the models either online or in the booklet included. 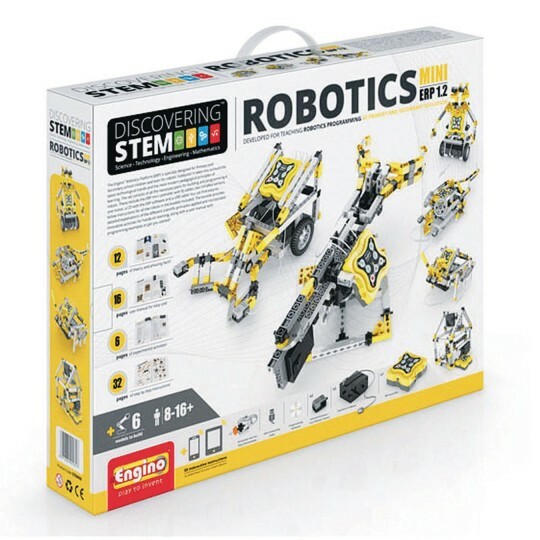 The booklet provides detailed explanations of the different scientific principles applied and incorporates innovative activities for hands-on learning, along with a detailed user manual with programming examples to get you started! Pre-recorded programs: The ERP controller contains pre-recorded programs in its memory, designed to control 4 specific models of the set! Build the model you like and set the controller in pre-recorded mode by holding the desired button pressed when turning on the device. The buttons and programs are described inside the User Manual booklet. Manual programming: the most innovative characteristic of the ERP is the onboard buttons, which allow manual programming without the need to connect to a PC. Programs recorded can then be imported to the GUI software and edited either via text language or graphical. TEXT EDITOR: A program written in any method is also displayed in a text form inside the Text Editor Window so that users can easily make changes in variables or even delete entire lines of code. Due to the encompassing commands and the “WITH PREVIOUS” and “AFTER PREVIOUS” concurrency variables, the particular language is much more simple to the level of being considered as a Pseudo-language. The Text Editor is an ideal introduction to traditional language based programming and bridges the gap between more modern Visual languages and the advanced text-based ones. System requirements: The software included can run on Microsoft Windows XP, VISTA, 7, 8 and 10. Minimum requirements for the PC is USB connection, 1 GB RAM, 50 MB of available hard-disk space, 1024x768 resolution display, DVD-ROM drive (or internet connectivity), DotNet 4. Unsupported systems for this version: Mac OS X.